Is this the face only a mother could love? 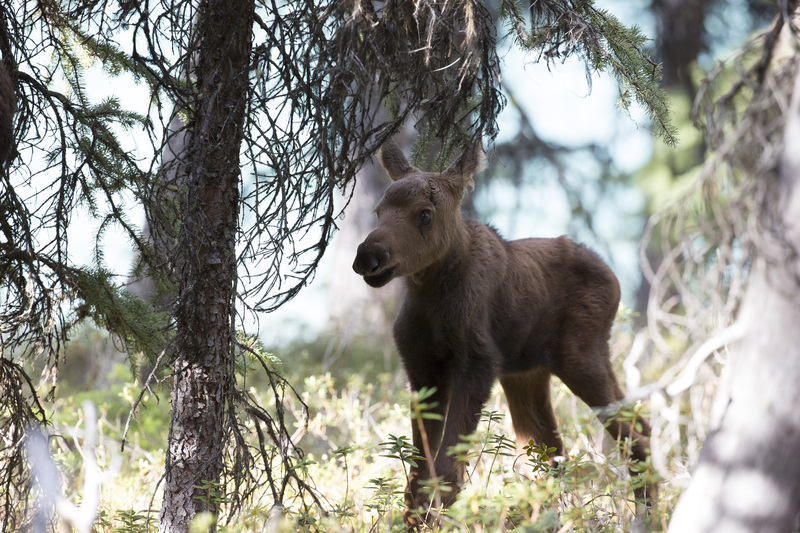 Little Moose Calf, one of the stars of MOOSE: LIFE OF A TWIG EATER on NATURE. Photo ©Twig Eaters Inc.
Moose are the largest species of the deer family, believe it or not. Big, gangly and frankly not the prettiest critter in the forest, they are hardly a match for Bambi in appeal and unbridled procreation. 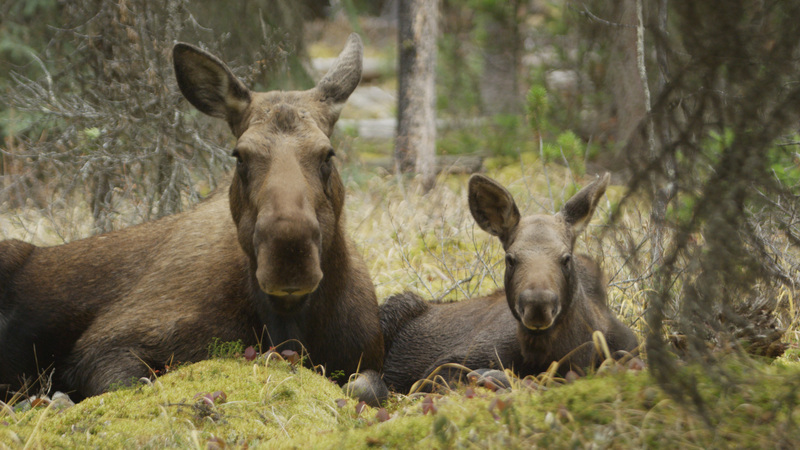 The moose population in North America is on the decline to a shocking degree, another casualty of climate change that impacts their habitats, food supply and their vulnerability to disease, which makes them especially defenseless around their natural predators. Little Calf and mom, Jasper National Park, Alberta, Canada, Fall 2014. Photo ©Twig Eaters Inc.
Naturalist and cameraman Hugo Kitching is the film’s predominant eyes and ears and, as the film progresses, its heart as well. He spends one year in the wilds of the Jasper National Park in the Canadian Rockies tracking two moose moms and their single calves. It’s a challenging assignment from start to finish since moose are elusive and their calves are easy targets for bears and wolves. And the terrain, all 4,000 square miles of it, is no picnic for man nor beast, especially in the winter when deep snow makes footing and feeding difficult for smaller calves and filmmakers lugging heavy equipment. Thrilled to find one mom with her newborn calf, Kitching then stumbles upon another mom and her late born calf. He’s immediately struck by his subjects’ individuality and reflects upon the challenges of mothering fragile calves, season to season, in an environment rife with predators. The calves’ learning curves–from feeding, swimming, and dodging danger–are patiently monitored by their mothers and by Kitching, who becomes progressively more attached to his subjects as they become more comfortable with his proximity. Little Calf at five days old. Jasper National Park, Alberta, Canada. Photo ©Twig Eaters Inc. If the calves manage to survive their first year, they’re booted out of “the nest” as their moms prepare to give birth to new calves. Then they must fend for themselves, motherless and alone. This touching rite of passage points out the loner existence of these creatures, which doesn’t bode well for their long-term survival. 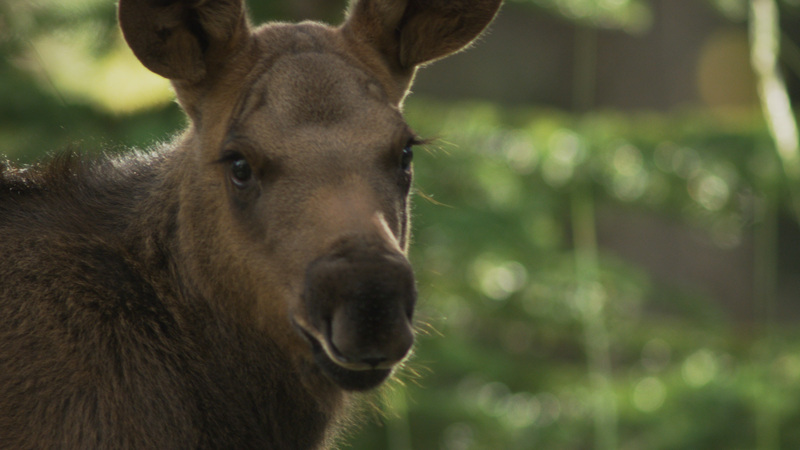 Moose: Life of a Twig Eater also takes a brief side trip to Grand Portage, Minnesota, where a dedicated team of biologists monitor individuals in the region’s dwindling moose population, which has declined by 64 percent since 1990. This entry was posted in TV and tagged Animals, Bullwinkle, Canadian Rockies, Endangered Species, Fred Kaufman, Grand Portage, Hugo Kitching, Jasper National Park, Moose, Moose: Life of a Twig Eater, NATURE, Nature & Wildlife, Susan Fleming. Bookmark the permalink.